Remember the HTC A55 that we told you about last month? 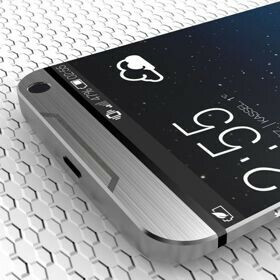 It looks like this isn't a new Desire smartphone, as previously believed, and, instead, it's going to released under the name HTC One E9. According to @upleaks (who provided accurate info about the One M9 before HTC announced it at MWC 2015), the One E9 could be launched in China as soon as late March. It seems that the E9 will be HTC's first smartphone to sport a Quad HD (1440 x 2560 pixels) display - one that measures 5.5 inches. However, unlike the M9, the One E9 won't use a Snapdragon processor, but a MediaTek one: a 64-bit, octa-core MT6795 processor clocked at 2.0 GHz. The One E9 should run Android 5.0 Lollipop with Sense 7.0 UI, while also featuring: BoomSound speakers, a 20 MP rear camera, 4 MP UltraPixel front-facing camera (or 13 MP, on some variants), 3 GB of RAM, and 32 GB of internal memory. It's said that the One E9 will be available in three color versions: white rose gold, metallic gray, and brown gold. All in all, this could be that One M9 Plus that you've been expecting, though it's not clear if HTC is planning to launch it around the world. We'll let you know when we find out more. P.S. : What you're seeing in the image above is just a concept design, not a real device. I hope this won't take the place of the m9 plus. but if it did, they should put the snapdragon 810 in it, imo. you mean the 810 that has overheating problem? Sure, why not?! True, but I don't feel like a mediatek processor would be too great of an alternative. Who knows, I might be wrong. I hope not. Aren't there issues with the 810? And we are not even talking about handsets with a QHD screen. Anyway it is better than Mediatek MT6795 by far. What a fail to put it with QuadHD display! The 810 is so suspect right now, I wouldn't trust it. But I wouldn't trust this processor either until it's proven. So a higher resolution with a crappier GPU.This is exactly what you need HTC. If its a mid range why is it so necessary to put a QHD display in it powered by some slopy processor. It has the same specs as M9 except QHD and Mediatek. So does that mean M9 is mid range? Just a hunch, but I bet this phone will not be available in the US. Oh come on, full hd screen with snapdragon 810 and QHD screen with with a mediatek processor. What on earth are you thinking htc?! the specs are more consistent with a Butterfly-type phone. i dont think you guys realise that the MT6795 SoC is actually a pretty damn good one, it has 120Hz display support and even 480fps1080 slowmotion. htc keen on screwing up their smartphones !